Since the beginning of human history, cattle have been central to our existence, not only as a source of food and labour but also as an inspiration for art, warfare and religion. 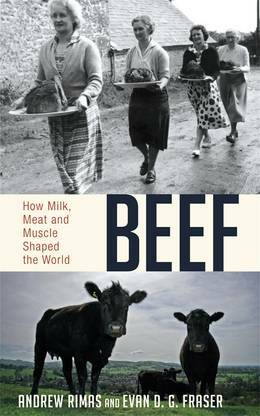 In Beef, an exuberant, panoramic view of the cow's rich history, Andrew Rimas and Evan Fraser tell the surprising story of our relationship with an animal that we have worked alongside, consumed and even worshipped for thousands of years. Rimas and Fraser examine the bovine legacy in its entirety, from breeding to braising, from hunting to worshipping, from ancient Mediterranean bullfighting rings to the rugged pastures of eighteenth-century England. Seasoned with anecdotes and recipes from across the globe, this entertaining tale serves not only as a compelling story but also as an indictment of the perilous state of beef production in Europe and the US - a situation closer to a health and economic emergency than most would like to believe. Readers will never look at a steak the same way again.